With half of the Candidates tournament behind us, Fabiano Caruana is now alone in first place after defeating Levon Aronian. Sergey Karjakin won a nice game vs. Wesley So, and the remaining two games were drawn. Aronian started the game by “sacrificing” a pawn. It’s not clear if it counts as a real sacrifice. It may be more accurately seen as simply being very casual about winning back the d4 pawn. The game ramped up significantly with the ultra-aggressive 16. g4 from Aronian. The move was criticized by some commentators, and after the game, Caruana called it a “complete surprise”. This move made the previous “sacrifice” more permanent and gave up the e5 pawn as well. However, Aronian developed a big initiative on the kingside and the defense for Caruana was not simple. Additional pieces then had to be sacrificed to feed the fire of the attack. The move 31. g7 should have secured a draw by perpetual check for Aronian, but he was unable to find it and was forced to resign soon after. Caruana’s victory completes a stellar first half of the tournament for him. On the other side of the board, yet another loss for Aronian puts him at the very bottom of the tournament standings. The queens were exchanged after ten moves and there didn’t seem to be a lot of life in the game, but Karjakin likes to grind these sort of positions, and he does it well. Eventually, the game reached an endgame where Karjakin was clearly better, but with so few pieces it would be difficult to convert. Karjakin continued to grind, and Wesley So never quite found a way to make a draw. Wesley So resigned on move 40. Speaking of grinding: This game started fairly slowly, but the difference was the somewhat exotic material situation after move 26. Kramnik had a queen for a rook, knight and pawn. Despite the imbalanced position, it didn’t give a significant advantage to either side. Ding probably would have taken a draw, (as he has in every game of this tournament so far) but Kramnik was clearly still trying to squeeze out a win and pushed on for 74 moves before acquiescing to a draw. 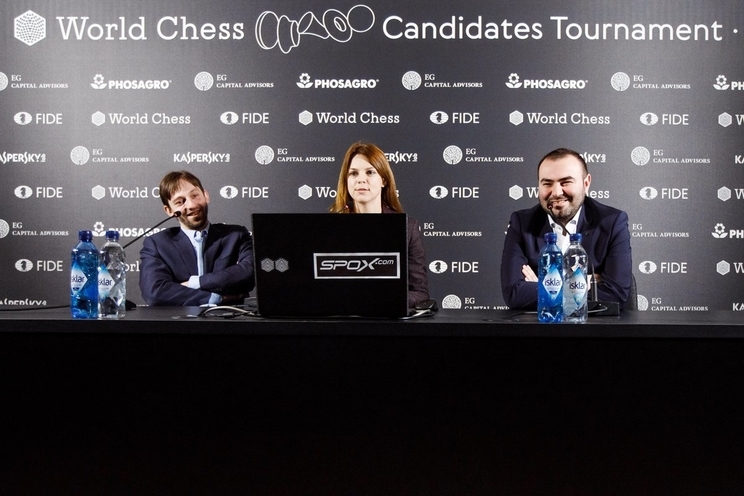 Being forced into a draw after only 16 moves is usually considered a serious misstep for White and Grischuk agreed, calling this game a “disaster”. Afterwards, he cagily declined to say exactly what he missed, not wishing to give away any more of his opening preparation. The half point left Mamedyarov in clear 2nd place. Round 8 starts tomorrow at 14:00 UTC. The pairings will be Mamedyarov-Karjakin, Grischuk-Kramnik, Ding-Aronian, and So-Caruana.